Robbing: a sad but pretty incredible phenomenon to witness. Honeybees have a sense of smell at least as good as a dog (and are in fact replacing dogs in some bomb-sniffing situations). When you leave frames of honey sitting outside the hive for too long, bees from nearby hives will show up and try to take it. 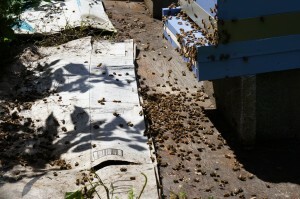 This sets off a robbing frenzy, with some bees trying to steal honey and others trying to protect it. Fighting ensues. Because the deep I have is full of honey and weighs about 70 pounds, I have to take about half the frames out before I can even lift it off the hive to get to the boxes below. This particular day, a few weeks ago, I wanted to take a good look at the activity in all the boxes, so the frames of honey were sitting out in the open for quite a while. I knew what would happen, but I couldn’t see any way around it. So I just went as quickly as I could, relying on my trusty bee suit to keep me from getting stung. My poor bees didn’t have suits. I was also stupid for not closing the entrance to that hive during the robbing. I was pretty amazed by what was happening by the time I was done inspecting, so I took a video (http://youtu.be/vtGNKa8lH2I). You can see bees rolling around on the ground trying to sting each other. The clicking you hear–especially near the end of the video–is the bees. I’m not sure if it’s just from them rolling around, or if it’s their stingers hitting the cardboard, or what. A couple of hours later, I went out and took the picture below. All those bees on the ground and cardboard in front of the hive are dead. 🙁 I felt horrible knowing I caused it. Yet another reason why I’m switching to all medium (i.e., lighter) boxes next year. I went out the next morning, and all those dead bees were gone. The remaining bees in the hive had dragged them as far away from the hive as they could get them. Super-tidy bees. Pretty astounding. Also: No stings for me. I’d say that’s pretty amazing for being in the middle of that frenzy for so long. Bee suit for the win! Great work! Looks like your robbers paid a dear price for what they didn’t get. One thing to do if you find yourself in the same situation again is to bring another deep and an old towel along with you and place the deep in the cover when you take it off. Put the frames you pull into that deep and cover the deep with the towel so no bees can get in. This will help immensly and keep the swarm around your head to a minimum. Also, the dead bees you see in front of the hive on the ground were probably eaten during the night by skunks or other critters and early morning birds who also love to eat bees. I’m goad to hear you hives are doing so well, especially with losing the original queens and having a swarm that was lost. You seem to be doing a tremendous job. I am sure if you were watching lately you saw the bees kicking out the drones. Next you’ll see the bees start to cluster when we have 3 days and nights near 40 degrees. Remember to set up the top of the hive to vent moisture and something to absorb it (newspapers around the inner cover hole or some light laundry bags filled with pine shavings above your top screen inside of a deep with the telescoping cover over that. Good idea on bringing along an extra deep next time. Hopefully switching to all mediums will speed things along a bit, too. And I unfortunately didn’t vent one of my hives well enough. 🙁 One of them didn’t make it, and I’m pretty sure that’s what killed them. I am so sorry to read the sad tale ….. right it off as a learning experience. I recall when you first set up this blog and your excitement about getting into the Beekeeping hobby/business. I am also sure that your enthusiasm is still there and you will get better and better as time passes along. If you recall my words during your initial decision on hive type selection I said weight was an important (and under estimated problem by most) factor. The 8 Top Bar box I build on the Warre Design weighs <3.2 lbs. – no bees, no product. A note here: Please this is not meant to be "I told you so" type statement nor a promo for my beehives. Just a discussion! I always have some large plastic boxes with lids around (they are fairly cheap) to store frames with product when manipulating the hives during inspections. An easy solution to prevent the above happenings.